A great keepsake to make and give to the happy couple and something no one else will have thought of. 1. Open the frame and take out the card mount and back board, stick the grey patterned paper to the backboard, add a strip of lace ribbon and a doily in the top right corner. Top Tip: Keep overlaying the card mount on top of your project so you can check everything is lined up. 2. Cut a piece of card into a tag shape approx 10 x 6cm, cut a hole near the top of the tag and thread with jute. 3. Cut a piece of white card to fit your tag and stamp with the details of your wedding, hand drawn the numbers with fine liner. 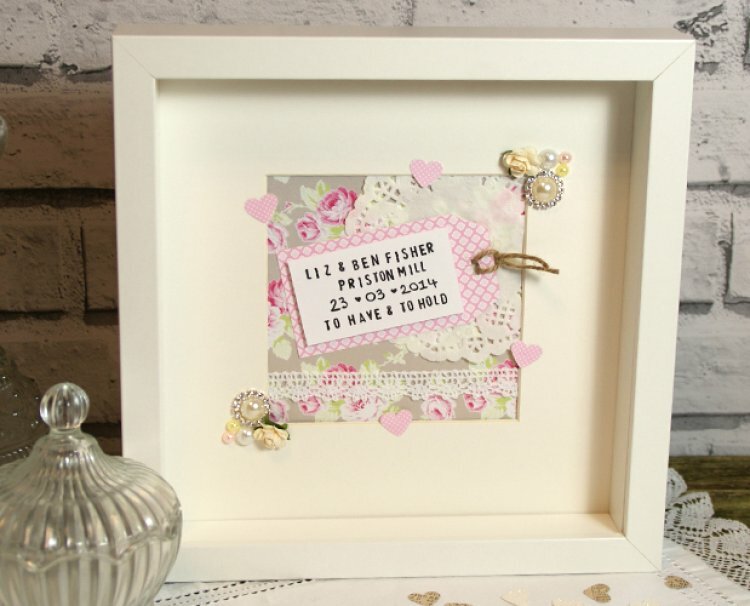 Stick down with foam squares and stick to the centre of your frame. Top Tip: Wait to glue down your design, lay everything out then you can make sure you are happy with the design. 4. In the bottom left and top right of the card mount, group the diamante charms, gems and flowers. 5. Finish by adding a few paper hearts around the mount, use foam squares for depth. These frames are also great for birthdays, new-borns and anniversaries. We hope you enjoyed our tutorial and don’t forget to show us what you make in the project gallery.